The podiums measure 45.5″ tall with a slanted top surface of 30″ x 18″. n your choice of color, these metal podiums bring an sophistication to any environment. There perfect for schools, churches and all presentations. They are easy to whip clean, and the large display space has optimal room for all presentation notes. Our podiums are made from top quality mdf and metal. They feature a unique design, the top and base is constructed with MDF, giving our podiums a sleek and modern design. 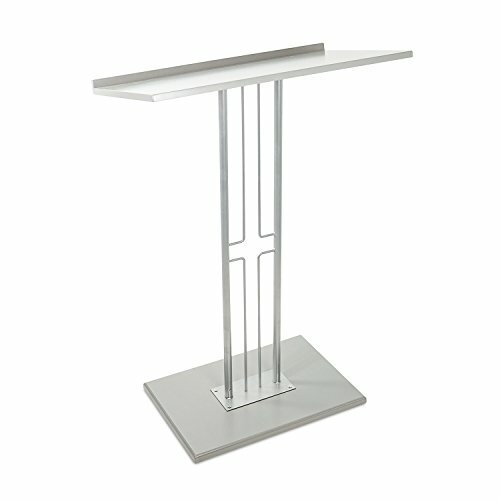 These low profile podiums are the perfect compliment for any church, school or any speaking engagement. PROFESSIONAL QUALITY. Our podiums are made from top quality mdf and metal. They feature a unique design, the top and base is constructed with MDF, giving our podiums a sleek and modern design. These low profile podiums are the perfect compliment for any church, school or any speaking engagement. EASY SET UP. SourceOne podiums ship to you in one box, simply follow the easy instructions and within minutes you're done. The heavy-duty metal finish is easy to clean, you can simply wipe off the outside. Source One podiums are designed for continued use and enjoyment for years to come. MONEY BACK GUARANTEE. Here at SourceOne, our products are always in stock. We provide the utmost in customer service and offer the highest quality of office and school supplies. We also offer a money-back guarantee, but don't let that deter you from choosing our products. We carry more stock than other companies, and it is always readily available. We offer multiple packages and sizes to cater to everyone's needs. View More In Lecterns & Podiums. If you have any questions about this product by SOURCEONE.ORG, contact us by completing and submitting the form below. If you are looking for a specif part number, please include it with your message. Fixture Displays Deluxe Wood Podium Reception Restaurant Podium 11479-2!